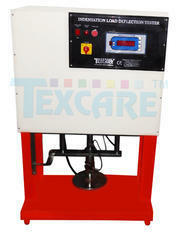 We are manufacturer of Foam Testing Instruments as per IS 7888 1976. 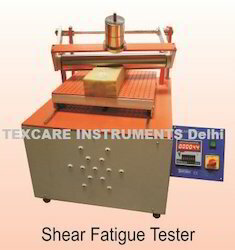 We manufacturer all instruments like Shear Fatigue Tester, Indentation Hardness Tester, Flammability Tester for Foam, Tensile Strength Tester for Foam, Thickness Tester and many more. 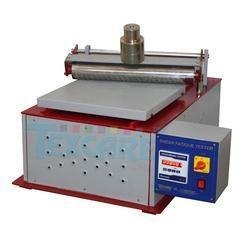 Shear Fatigue Tester is used to determine the effect of repeated compression in Polyurethane foam. In this test, the test specimen in shape of 380 x 380 mm square is held over a flat reciprocating platform and is pressed down from the top by a horizontal cylindrical roller inclined at an angle of 15 deg. to the direction of motion of the platform. The platform is moved for a specified number of cycles and the effect of repeated compressions produced on the test specimen is evaluated by finding the change in its thickness and indentation hardness index.